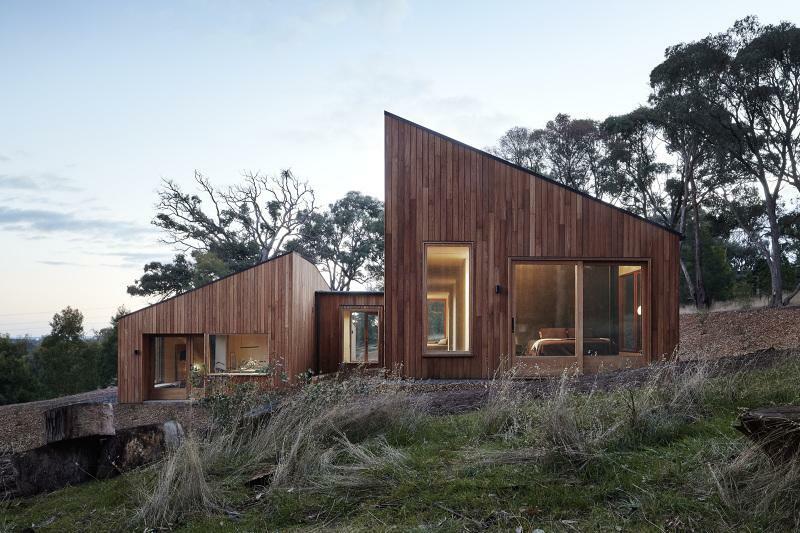 Taking the ubiquitous pitched-roof, country house form and splitting it in half, the Two Halves House sets up a close relationship with its bush setting. The two halves of the house are offset from one another and separated to drastically improve access to northern light. The upper pavilion houses a cellular arrangement of bedrooms and bathrooms, and forms the more private part of the building. The lower pavilion is the more public side of the house with a large, open living space, and access to views on the south. Landscape spaces are invited in to the interior from all sides of the house, as the split form nestles into the site and creates eye-level connections to outside. Windows are provided at the end of each circulation axis to further open up the building and create through connections. The material palette is minimal and raw from the outside, but warm and refined on the inside. Naturally fire-resistant Blackbutt is used for the exterior cladding and windows, and light-toned birch ply is used to line the interior walls and ceilings. A custom-designed steel island bench reflects the angles of the split form, including a raked ceiling and skylight that encourages you to look up as well as out.